The story the other day that AIG was considering suing the taxpayers because the taxpayers did not give them a nice enough bailout was so vomit-inducing that I did not even look much further into it. Every taxpayer and shareholder should be rooting for this case to go to trial. It addresses an important Constitutional question: When does the federal government have the authority to take over a private business? The question looms larger since the 2010 passage of the Dodd-Frank law, which gave the feds new powers to seize companies they believe pose risks to the financial system. That vague concept of "systemic risk" was the justification for the AIG intervention in September 2008. In the midst of the financial crisis, the federal government seized the faltering insurance giant and poured taxpayer money into it. The government then used AIG as a vehicle to bail out other financial institutions. But the government never received the approval of AIG's owners. The government first delayed a shareholder vote, then held one and lost it in 2009, and then ignored the results and allowed itself to vote as if the common shareholders had approved the deal. In 2011 Mr. Greenberg's Starr International, a major AIG shareholder, filed a class-action suit in the U.S. Court of Federal Claims in Washington alleging a violation of its Constitutional rights. Specifically, Starr cites the Fifth Amendment, which holds that private property shall not "be taken for public use, without just compensation." The original rescue loans from the government required AIG to pay a 14.5% interest rate and were fully secured by AIG assets. So when the government also demanded control of 79.9% of AIG's equity, where was the compensation? Greenberg is apparently arguing that he would have preferred chapter 11 and that the company and its original shareholders likely would have gotten a better deal. Perhaps. So I will tone down my outrage against Greenberg, I suppose. But nothing about this makes me any happier about bailouts and corporate cronyism that are endemic in this administration. This story is simply unbelievable. Shareholders of AIG should have been wiped out in 2008 in a bankruptcy or liquidation after it lost tens of billions of dollars making bad bets on insuring mortgage securities. Instead, AIG management and shareholders were bailed out by taxpayers. It is bad enough I have to endure those awful commercials with AIG employees "thanking" me for their bailout. It's like the thief who stole my TV sending me occasional emails telling me how much he is enjoying it. Now, AIG managers and owners are considering suing the government because the the amazing special only-good-for-a-powerful-and-connected-company deal they got was not good enough. Directors at American International Group Inc., AIG -1.28% the recipient of one of the biggest government bailout packages during the financial crisis, are considering whether to join a lawsuit that accuses the U.S. government of too-onerous terms in the 2008-2009 rescue package. Starr sued the government in 2011, saying its taking of a roughly 80% AIG stake and extending tens of billions of dollars in credit with an onerous initial interest rate of roughly 15% deprived shareholders of their due process and equal protection rights. This is especially hilarious since it coincides with those miserable commercials celebrating how AIG has successfully paid off all these supposedly too-onerous obligations. And certainly Starr and other AIG investors were perfectly free not to take cash from the government in 2008 and line up some other private source of financing. Oh, you mean no one else wanted to voluntarily put money into AIG in 2008? No kidding. 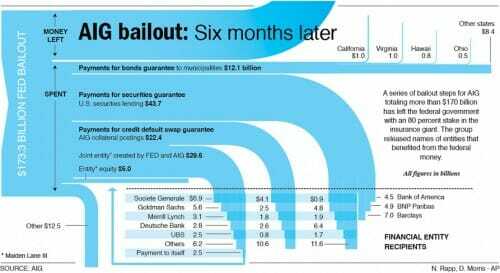 Postscript: By the way, employees of AIG, you have not paid off all the costs of your bailout and you never will. The single largest cost is the contribution to moral hazard, the precedent that insurance companies, if sufficiently large and well-connected in Washington, can reap profits on their bets when they go the right way, and turn to the taxpayer to cover the bets when they go wrong. Having once been successful through excellence, leading businesses typically get lazy and senescent, and become vulnerable to more innovative, lower-cost or more nimble new competitors. Sears lost its electronics sales to Circuit City, which in turn succumbed to Best Buy, which is now struggling to compete with Wal-Mart, who is being challenged by Amazon.com. Unfortunately, businesses that were once successful can feel a sense of entitlement, believing that this new competition is somehow unfair, or that consumers are somehow misguided in taking their business elsewhere. When they have money or political connections, these businesses may run to Congress and beg for special protections against competition, or even new subsidies, mandates, stimulus projects, and bailouts. Where is the threat to capitalism and individual liberty coming from today? Is it from some aggrieved proletariat, or is the threat from bailed out Wall Street firms, and AIG, and GM, and Chrysler, and ethanol manufacturers, and electric car makers, and windmill builders? My new column is up at Forbes, and it is one of my favorites I have written for a while (at least it seems so with my current scorpion-induced double vision). It begins with Krugman's recent statement that the Left understands the Right and libertarian positions better than the Right and libertarians understand the Left. But I do understand the leftish position well enough to identify its key mistake. As I mentioned earlier, we libertarians are similarly concerned with aggregations of power. We have, at best, a love-hate relationship with large corporations, for example, enjoying the bounties they can bring us but fearing their size and power. But what the Left ignores is that there is absolutely no power imbalance as large as that between the government and its citizens. After all, you may get ticked off when Exxon charges you $4.00 a gallon for gas for reasons that aren't transparent to you, but you can always tell Exxon to kiss off and buy from someone else, or ride a bike, or stay home. Because Exxon does not have armies and police and guns and prisons. Every single time we give the government the power to right a perceived imbalance, we give the government more power than the private entity we are trying to contain. In effect, we make things worse. Because we want the government to counter-act the power of oil companies, Congress now has the power to dump large portions of our food supply into motor fuel, to the benefit of just a few politically connected ethanol companies. One of the reasons the Left often cannot adequately articulate the libertarian position is that the notion of bottom-up emergent order tends to be difficult for many to understand or accept (this is mildly ironic, since the Left tends to defend the emergent order of Darwinian evolution against the top-down Christian creation vision). The key to much of libertarian economics is not that libertarians trust private actors, but that libertarians trust natural correction mechanisms in free markets far more than it trusts authoritarian power of the government. When, for example, large corporations become sloppy and abusive and senescent, markets will eventually bring them down. In fact, when government is given power, nominally to correct such imbalances, they tend to use it to protect those in power as often as they do to protect the disenfranchised. Government restrictive licensing of hair dressers, interior designers, and morticians; bailouts of GM, Chrysler, and AIG; corporate welfare to GE and ADM; and use of imminent domain to hand private property to favored real estate developpers -- all are examples of finding government cures for perceived private power imbalances that are worse than the disease. Isacc Asimov, in a book called Foundation that Paul Krugman recently rated as one of the most influential on his life, related this fable: Once there was a man and a horse, who were both imperiled by a wolf. The man approached the horse, and said that if the horse would put its superior speed at his disposal, he could kill the wolf. And so the horse agreed to take the man's saddle and bridle, and helped the man kill the wolf. The horse said, "great job, now remove your saddle and we can both be free," and the man said "never!" I hope the moral of the story is clear. In trying to deal with the threat of the wolf, the horse gave the man so much power he became an even bigger threat. So too when we look to government to solve our problems. One of the perils of being a populist, as John McCain is finding out, is that the public is allowed to change its mind, but politicians who attempt to follow them end up looking bad. the four-term senator says he was misled by then-Treasury Secretary Henry Paulson and Federal Reserve Chairman Ben Bernanke. McCain said the pair assured him that the $700 billion Troubled Asset Relief Program would focus on what was seen as the cause of the financial crisis, the housing meltdown. "Obviously, that didn't happen," McCain said in a meeting Thursday with The [Arizona] Republic's Editorial Board, recounting his decision-making during the critical initial days of the fiscal crisis. "They decided to stabilize the Wall Street institutions, bail out (insurance giant) AIG, bail out Chrysler, bail out General Motors.... What they figured was that if they stabilized Wall Street - I guess it was trickle-down economics - that therefore Main Street would be fine." I am not sure this is much of a defense. Even without McCain's access to such financial luminaries, I and many others predicted at the time the $700 billion slush fund would be used as, well, as slush fund to bail out the politically well-connected. I must admit I didn't see the GM/UAW bailout coming, but its not wildly surprising in retrospect. Unfortunately for all of us, McCain's competition in the next election, JD Hayworth, is even less appealing. I guess the disputed $175 million in deferred compensation payments should be on here as well, though the line would be too infinitesimally thin to draw. The CDS stuff gets the attention, but the securities guarantees are the largest flow. Are these guarantees of traded securities, like bonds and equities? If so, it sure is a happy notion for all of us taxpayers with portfolios that are well under water that we are going to send some of our money to help bail out the losses in the Goldman Sachs portfolio. Wrapped in the Flag of "Systemic Risk"
2. In a bankruptcy, how senior would contractual promises of deferred compensation to employees be? Everyone comes after the government, of course, but would such claims be more or less senior to, say, commitments to pay counter-parties? ** before claiming one commitment was outrageous and unjustified, one needs to be clear which commitment he is referring to, since both commitments in retrospect seem crazy to me. It is just that one party (ie Goldman Sachs), which has the added advantage of being represented by many of its former employees in the Treasury department, has convinced Congress and the Administration that not paying them carries systemic risk to the economy. That seems to be the new key to government largess: Carrying systemic risk. It used to be one wanted to be poor or female or black to merit special consideration in the government spending sweepstakes. But nowadays, in our post-racial society, the key is to be the one who can wrap himself in the flag of "systemic risk." Here is . in the economy. They had been set up to support the housing market. and squeeze the private sector out of the "conforming" mortgage market. Fannie and Freddie as a substitute for U.S. Treasury securities and snapped it up eagerly. announced that it would explicitly guarantee the debt. buffer the losses. Hence, the Treasury ended up taking them over. rapidly change the risk on their balance sheets, lenders opt for short-term lending. Compared to legal or other channels, their threat to refuse to roll over funding is the most effective option to keep the borrower in line. including the losses at Freddie Mac and Fannie Mae, this view spread. were going to prevent certain firms from continuing to lend to Lehman. A.I.G. had to raise money because it had written $57 billion of insurance contracts whose payouts depended on the losses incurred on subprime real-estate related investments. called credit default swaps (C.D.S. 's), were hemorrhaging. suggested that it needed roughly $15 billion in immediate collateral. collateral, it would be considered to have defaulted on the C.D.S.'s. the Fannie and Freddie bonds, but still dispersed widely. in the world "” had guaranteed A.I.G. 's bonds by writing C.D.S. wreak havoc on the financial system and cause contagious failures. contracts, so the Fed loaned A.I.G. $85 billion. Legionaire's disease, and you can't make the payments. can cadge before heading to the hills" ? But no one wants to believe that. calm things down a bit?". Eliot Spitzer has been brought down for a crime most libertarians don't think should be a crime, by federal prosecutors who should not be involved even if it were a crime, and using techniques, such as enlisting banks as government watchdogs of private behavior, that stretch the Fourth Amendment almost out of recognizable shape. So why are we libertarians so happy? national television to accuse the AIG founder of "illegal" behavior. Within the confines of the law itself, though, he never indicted Mr.
Greenberg. Nor did he apologize. Sachs chief published an article on this page defending Mr. Greenberg. "I will be coming after you," Mr. Spitzer said, according to Mr.
beginning, and you will pay dearly for what you have done." -- by one man with virtually unchecked legal powers. Majority Leader, Joseph Bruno. On any level, it was nuts. As I wrote before, the real crime here is that despite all his history, he was until two days ago a press darling labeled as "Mr. Clean." In reality, he has always been Mr. Abuse of Power and Mr. Personal Vendetta. I am happy to see him brought down, even if for the wrong reasons.